I’ve been overwhelming happy with all that’s happened over the past month. It’s a gift to be able to share my words and stories with readers, and I am working hard to get “Seconds Before Sunrise” ready for publication this Fall. Speaking of which, this blog will be changing in the future to support the entire trilogy. It will have the same layout, but I will announce when it’ll have new pages (with more extras!) I’ll probably be adding a page for just writing and publishing tips too, so you can go back without having to use my search engine. Onto today’s topic: I have one review by Coffee Shop Reader and an interview from The Kuwait Times, but I’ll also be sharing stats and feelings over my recently published novel, Minutes Before Sunset. I also have a press release from AEC Stellar that I’d like to share. It includes my novel, but it also shows upcoming and talented novelists, including Amber Skye Forbes, Oliver Chase, and Gregory S. Lamb! Read the rest here. Additionally, the host aspires to live in the realm of stories, and she loves reviewing novels, so check her out! Her reviews are detailed and honestly balanced. Read the questions and answers here. But I’d suggest reading about Anglowaiti writing. It’s culturally diverse and thoughtful, while challenging writers to expand their palate into the writing industry. Nada Faris (the interviewer) is a talented young writer with three novels published. I wanted to share these, because I think it gives insight to the publishing industry. But I’m also sharing these out of the goodness of my heart. I will not lie and say I am in the top ten, because I am not (although that would be amazing!) I ask to please respect the rankings in the sense that this is information I am not obligated to share but am sharing in the hopes of helping others use this tools for their novels’ spectrum of sales. I specifically wanted to share the ratings through AmazonCentral. For all of you who aren’t familiar with this website, this shows a graph of ups and downs, along with ranking within the genre. I find these rankings exciting, but I mainly think they can help you all sell your books! For instance, ranks go up on holidays (specifically Mother’s Day and Memorial Day.) They also go up on the days I blog post, so keep your blog going on a regular basis. My Facebook Pages also help keep track of sales. For instance, I reached over 2,000 people between April 26 and May 2, so I can conclude the release date reaches many. Top cities were in the Midwest, but countries included US, Canada, Kuwait, France, and the United Kingdom. This helps me know my reached audience while also allowing me to realize where I need to improve. Overall Facebook Shannon A Thompson rankings. Let me know if you’d like to know more about any topics, and I will surely elaborate in a future post. 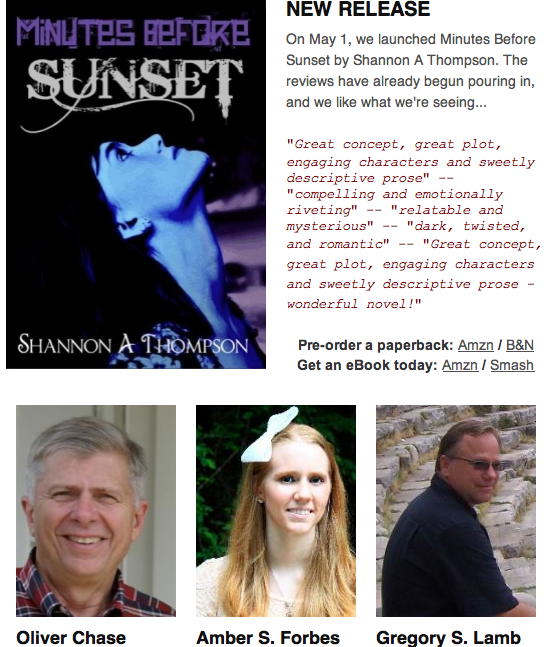 I will also credit your blog (with extra information on your blog) and, again, my publisher will give out a free copy of Minutes Before Sunset to anyone wishing to review the novel. Simply email me at ShannonAThompson@aol.com for more information, and, again, your blog will be credited on all of my websites including Facebook, Twitter, and here. Minutes Before Sunset is available as ebook and paperback on: Amazon, Barnes & Noble, Smashwords, Kobo, Diesel, Sony, and Apple. Mch success to you in your future writing endeavors. Congrats on those rankings. They look pretty high to me! And such great reviews!!! So awesome! Wow! The graphing tools are helpful and informative for us that are almost there, but also very awesome for you! How exciting! Congratulations! I hope you and your books continue to gain popularity and readers. I’m glad you found them so helpful! That was the goal. :] And thank you for the congratulations! I appreciate your encouragement. Cool to see some stats on it – I’m always curious about how fellow authors’ works are faring (I think you mean AuthorCentral, though?). Hope it only goes up! I did Author Central and Facebook page stats. Very impressive Shannon. Congrats again. Thank you, Miranda! You are very kind. The signed paperback arrived. Thank you!!!! Yeah! Good to hear. You’re welcome, and I hope you enjoy it.